Saturday saw the annual Helston Carnival take place. That means the Friends and Residents of Bulwark Association gets to dress me up in a costume. Their rule is, they make it, I have to wear it. And believe me, I have worn some very interesting costumes. The association’s float theme this year was Helston 10 million years BC. When I found out the theme I did fear I would be made to dress like Raquel Welch…. and I would have to wear the costume, which would have resulted in a lot of therapy for those who had the misfortune to witness it. However, and to great relief, my fears were averted when I found out I was to be a caveman. Now you have got over the shock of my outfit, it is time to see the fantastic float which the association put together. It is not just the float which is fantastic, but all the costumes too. These were made – yes made – by the association. Special thanks should go to the National Trust at Penrose Estate who kindly supplied the trailer and tow vehicle. This years carnival saw an increased turnout of floats, so competition for best of class and over all carnival winners would be tight. The Bulwark float still did well, as they came second in the small float category and were beaten by an excellent Alice in Wonderland float. So well done to all who took part. This event would not be the success it is without the people organising the event and the marshalls. So a huge round of thanks should go to these volunteers for giving up their time to make this carnival such a success. Helston Carnival was held on Saturday 7th September. This event has seen a steady increase in participating floats, and this was the best for many years with so many entrants. The Bulwark Residents Group has been entering the carnival for the last three years. And impressively been rather successful by winning the best small float for the last few years. Last year the group won best over all float of the carnival. This year the group decided to enter as recycling heroes. This was to raise awareness of recycling. As you can see from the previous picture the group looked fantastic. A lot of effort went into the groups float and the costumes. This is down to the hard work of the group who spend hours if not days on making sure the float and the participants look the best they can. The next picture is my costume, and the rules the group make – which I have to adhere to – is they make it and I have to wear it. This always has me worried until I see the costume and see the effort they put into it. Congratulations should go to the organisers of the Helston Carnival for all the hard work they put into this event. Without this work, the event would have disappeared like so many community other events have. A well done should also go to all the other participants in the carnival, who make this a great day for all. The best float of the carnival went to The Blue Anchor, for their summer holiday float. Lastly, a special thank you should go to the National Trust at Penrose Estate, who kindly supplied the trailer and transport to pull it, and a one of its rangers to drive the float around Helston. Without this support, the group would not be able to enter a float. The Bulwark (and friends) Residents Association again entered the Helston Carnival. This year, the association picked the theme of the Olympics. I was again was volunteered by the group to be part of it. Though I love taking part, however I think they like making me dress up in something ridiculous. There was a good number of floats this year, so competition was going to be tough to win one of the trophies. Last year the group won the best small float and best overall float. So, it was going to be a tough act to follow. The judging was undertaken by the Leader of Cornwall Council, Alec Roberson, who really entered into the spirit. To the groups credit, and hard work in getting the float together, they won best small float AND best overall float in the carnival. It was fantastic to win not just one, but two trophies! The group is a credit to their neighborhood for all the hard work in putting the float together. Well done to Julie Eddy, the Chairman of the group. All the committee, parents and children who took part. Special thanks must go to the local National Trust; who provided the Land Rover, driver and trailer for the float. Helston Carnival took place on Saturday and one of the two residents groups I work with again entered a float. I have a real soft spot for Bulwark Residents and Friends Association because since its formation near two years ago on they have done wonders to improve their area. Last year Bulwark entered with an under the sea theme and won the best small float. Which was a fantastic result. 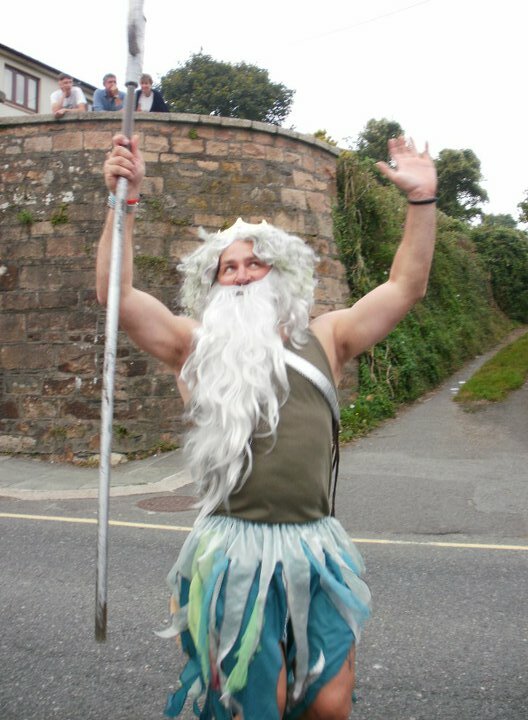 This year the association came up with the idea of Spirit of Cornwall; basically legends, myths and current traditions. I was told by the group I was going to be ‘The Beast of Bodmin Moor’. The truck and trailer for the float was kindly supplied by National Trust at Penrose Estate. Without their kindness in allowing the use, and supplying a driver (Alistair) there would be no float. They deserve a huge thank you. As for the float many of the children were dressed as miners, or flowers. We also had Cornish Wrestlers, Mermaid, Pirates, Flora Dancers and other weird and wonderful costumes. At judging the group hoped to do well. When the results came the group were shocked twice. Not only did the group again win the best small float, it also won the best float overall! To win the best small float was great, but to win the best of the carnival was just fantastic. As special thanks should go to Julia who did most of the organising for the float and the other parents of the children who all chipped into make this such a success. The Carnival would not even take place if it was not for the organisers. A huge thank you for their time and effort in making this event a success. As you may know I have been working with the Bulwark Residents Association to help them raise £80k for their new park. This weekend they entered the Carnival doing a ‘under the sea theme’. It was great as we had 18 children and 7 adults as part of the float. The Children has all made fish hats and fish flags. The truck was decorated in the same theme. I was King Neptune. (see right). It was a great afternoon, especially the parade around Helston. I have to say a massive thank you to Porthleven Metal Works who kindly provided the truck and the driver for the float . Without them, we would not have been able to do the event. I really like working with this group. They are a lot of fun, and who really want to make their area better for everyone. A special thank you should also go to Julia, Amanda, Rob, Cookie, Nic, Mel, Karen, Carrie, Anita, Zoe and Julia’s Mum who helped out to make this a great day. It was topped off as we won the small float section!! The children were over the moon with winning and all wanted to hold the trophy. A thank you also to the Harvest Fair Committee and Helston Town Council for the organising and running this event. Without them and their hard work, this event would not have taken place. So far in only a few weeks the Residents Association has managed to raise just over £300 doing a sponsored walk and naming a teddy bear competition. The Committee of the Association has voted that the next fund raising event is for my legs to be waxed. Of course this was a unanimous vote by the Committee, so who am I to argue with democracy at work!